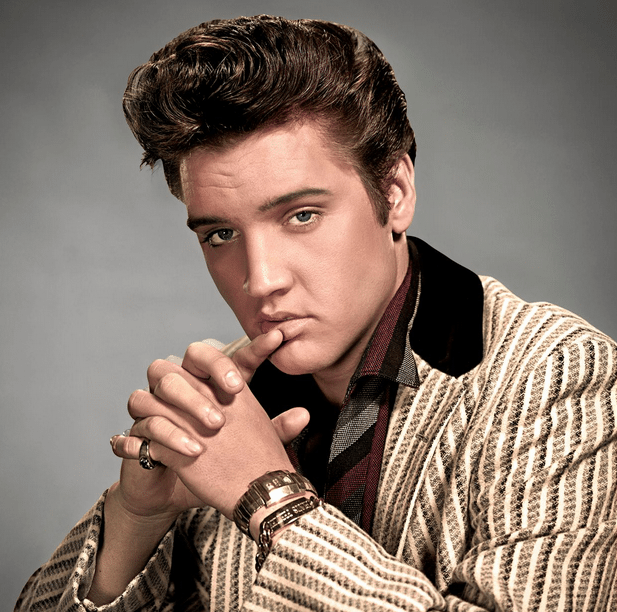 Born in Tupelo, Mississippi, Elvis Aaron Presley was the surviving twin and only child of Vernon and Gladys Presley. He grew up among family and a tight-knit community which included his Assembly of God church family. The gospel music he grew up around and the Bluegrass and Jazz which permeated the air in the South were huge influences on Presley. His first foray into entertaining was a youth talent competition at the Mississippi-Alabama Fair, and Dairy Show held when he was ten in Tupelo. Early in 1956, Presley releases “Heartbreak Hotel” and sells over 300,000 copies, catapulting him to number one on Billboard’s pop singles chart. With his appearance on Jackie Gleason’s “Stage Show,” his popularity becomes more and more mainstream. In the span of the next two decades, Elvis made 31 movies and two documentaries released 24 albums and writes or sings on 18 movie soundtracks. Amid all his popularity and personal struggles, Presley often sang the gospel songs of his youth: returning again and again to the faith of his early days. His ninth album “How Great Thou Art” set records on the non-gospel charts, ranking eighteenth on the Top Pop Albums chart. His talent was undeniable and his contribution to modern music: unmistakable.